Players stand on the service line. Both players are only allowed to play their designated shot. Player 1 hits a topspin shots; Player 2 returns the ball by hitting half-volleys. A rally is a real test of a player's acquired skills and a good way to mimic match scenerios. It is important that players are able to execute half-volleys, even when every ball hit to them is different. 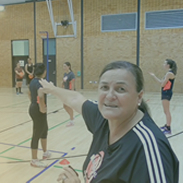 The coach should be watching the players to see if they are reacting quickly and keeping a low, balanced position. If the players are doing well use a variation of this drill by asking player 1 to stand close to the net to hit volleys. This means player 2 has less time to react so he has to be quicker with his footwork to still hit the half volley.